Frank (Joel Murray) has become disillusioned not only with his life, but also with the current state of society. His neighbours are inconsiderate, his daughter is turning into a reality TV wannabe and he’s recently been fired by his boss. He daydreams about doing his bit to save society from crumbling entirely, but simply doesn’t have the stomach to carry this out. However, when he’s told by his doctor that he may have a life-threatening brain tumour, he decides that life is too short for mindless daydreams and sets out, with the aid of a sociopathic teenage girl (Tara Lynne Barr) who becomes obsessed with his brass attitude, to eradicate the world of its inconsiderate time wasters. 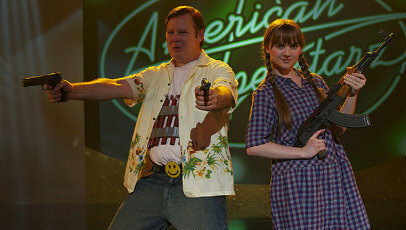 More social satire than anything else, God Bless America is the brainchild of writer and director Bobcat Goldthwait. And, while it bears some interesting, thought-provoking arguments on social degradation, the obsession with the need to be famous, social networking and gossiping about celebrities whom we’re likely never to meet, he doesn’t quite have the perseverance nor cultivated narrative for this to come out in a way that doesn’t feel like word repetitive vomit. It’s not that the dissections are in any way inaccurate (particularly as numerous real life celebrities and situations are name-checked throughout, adding a layer of realism to proceedings), it’s more that the overall narrative is shockingly paper thin. Most of the speeches and scrutinies delivered by Frank, and at times Roxy, have a noticeable lack of weight behind them that, more often than not, renders their downward spiral unbelievable. It’s simply a rant stretched over an extended running time, lacking in characterisations, direction and audience repayment – aside from a few mild chuckles. What makes God Bless America work, then, at least in its opening act when the initial foundations are being laid and we’re first introduced to Frank, is Murray’s performance. Not keen on making Frank a person who simply hates the world, he’s portrayed in a way that represents someone who genuinely cares about maintaining a decent level of respect in society and only punishes those who seem hellbent on screwing things up for everyone else. It’s only when Barr’s Roxy is introduced – delivering a performance that’s as shaky as the film’s tone – that the film veers off the solid bedrock established by Murray’s early scenes as a social critique who has lost his way. It makes it even more of a shame, then, that Goldthwait lets the film fall to pieces in the way it does. What starts out as a unique, black comedy about a loud-mouthed man dismayed with the current state of society, underpinned by a strong political subtext, quickly descends into an inconsistent, mildly enjoyable, yet noticeably tapered bloodbath with only a semblance of the intrigue it boasted at the start. Whatever decency is buried underneath the disorder, particularly Murray’s convincing performance and Goldthwait’s initial thoughts behind a social critique, become lost at an attention forfeiting speed.